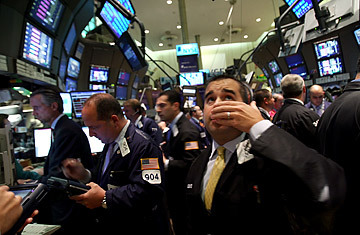 In the wake of the U.S. House of Representatives' 228-205 rejection of the Bush administration's $700 billion bailout bill, the Dow Jones industrial average plunged 778 points. It was the largest one-day drop in history, though in terms of market percentage lost, it failed to approach the calamitous crashes of 1987, 1929, and 1914. After investment banking giant Lehman Brothers filed for the biggest bankruptcy in U.S. history and Bank of America swallowed Merrill Lynch, the market tumbled amid fears the insurance titan AIG was the next to fall.